Anyone Can Be A Bully: Thoughts on Convergence, Rent, and Misunderstandings about "Conformity"
I recently assigned my students an observation exercise on convergence—convergence occurs when people change their speech patterns or dress or body language to match that of a group. For example, if I move to Maine and start using phrases like “Wicked good” and “Right out straight,” I am practicing convergence. Convergence is normal. It occurs amongst teens and cliques; it also occurs in workplaces, religious and non-religious organizations, states, and nations. Convergence is the beginning of culture. This brings me to Rent, which I recently watched for the current list on the Mike-Kate Video Club: Musicals. Rent is the ultimate story of convergence. The core members of the group share a similar ideology. They practice similar dress (Angel doesn’t look that atypical when s/he is with the group). They have similar attitudes about drugs, AIDS, and NYC. They hang out in similar places. They talk the same. They have similar careers/artistic lifestyles. They show similar contempt towards the same things. There is nothing intrinsically wrong with this. Convergence, as I stated above, is natural. unique than the others? If you'd never seen the musical? Where it gets supremely annoying is when a group decides, in face of all rational observation, that they are NOT practicing any kind of convergence. *They* are not conforming to a specific culture; they are all rugged individualists. Only *conventional* people conform: you know, people in suits. *Those* people conform. But free-wheeling Bohemians like "us" never conform. Why does the group in Rent believe they aren't conforming to a group dynamic? Their actual behavior exemplifiies rigorous adherence to a "code," so how do they maintain the illusion that they are promoting individuality? They maintain the illusion that they are being unique and different and pushing others to be unique and different by saying so over and over and over again. Mark films things and talks; Roger (who at least has the merit of trying to differentiate himself) sulks and talks; Mimi actually has a paying job as does Joanne but when they are with the group, they just talk; Maureen blathers on and on and on. In fact, the great irony of the musical is that the one person who actually does something, Benny, is treated with utter antipathy by the others; not only does Benny pay for Mimi to go into rehab, his business plan would raise the standard of living in the area and bring in money to build homeless shelters and free clinics. Where does the group think money for homeless shelters and free clinics comes from? It certainly doesn't come from a bunch of Bohemians who can't even pay their rent. The musical, while lightly acknowledging that the group isn't exactly changing things (it's not their fault; it's America's fault! ), falls back on the belief that talking loudly and aggressively (e.g. sticking bumper stickers all over one's car) is the solution to society's ills. Granted, this particular silliness is symptomatic of this particular culture. What makes Rent truly unlikable is how the gang bullies and punishes strayers from the foreordained path of its convergent culture. All overtly divergent decisions are promptly squashed by the group. Move to Santa Fe? Only if you do it to "find yourself" and come right back. Get a job making actual money, a job--moreover--that could morph into something downright interesting? Not if it means you can't make your home-made movies. Quit drugs? Well, yes, drugs are very, very bad, but not so bad that Roger should actually walk away from a mutually destructive relationship; he should stay and love Mimi until she stops (because people on drugs always stop because other people love them so much). The most startlingly cliquey part of the movie occurs when Roger and Mimi decide to date only after they learn that the other person has AIDS. Yup, that's right: AIDS, the ultimate ticket of belonging. Go get yourself some today! 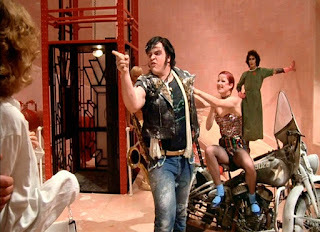 The musical really hits a low point in the gang's treatment of Benny, the only character who demonstrates any real individuality. 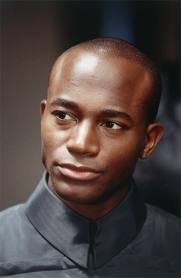 (And kudos to Diggs for wearing his divergent dress without shame--because, let's face it, Diggs looks good in a suit). Benny is treated like a pariah because he is “conventional” and doesn’t want to live in the slums. It is hard to take a 2-hour musical based on this mindset seriously. It is one thing to accept the trials and tribulations and poverty of a calling (be it art, social justice, or taking the veil); it's quite another to shove those trials and tribulations and poverty in people's faces as if said trials and tribulations were automatically ennobling. Not that I regret watching Rent (after it was over anyway). 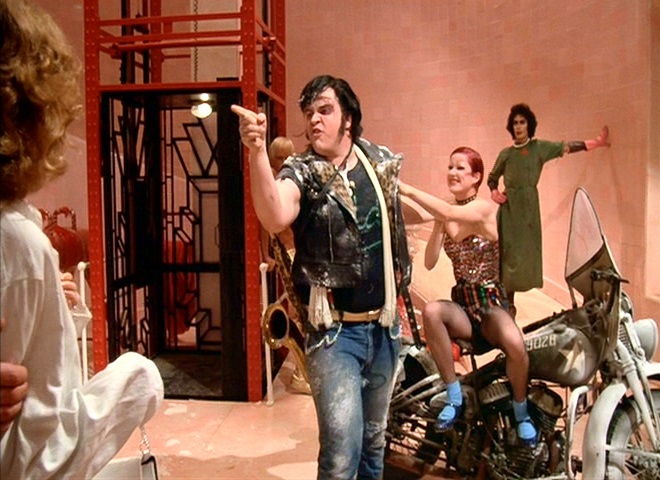 It would be hard to understand the history of musicals without seeing it—and my somewhat less negative review of the actual musical can be found on the Mike-Kate Video Club alongside a review of The Rocky Horror Picture Show. Oddly enough, I found the latter, though far more visually disturbing than Rent, far less irritating. It's the difference between a show (TRHPS) that says, "Here's an alternative culture. WOW!" and a show (Rent) that says, "Here's an alternative culture. You must admire us! Love us! Appreciate us! If you don't, we hate you." Tim Curry struts in the background. Rent is the not-very-popular-clique deciding it ought to be popular, nah, nah, nah. Rocky Horror doesn't care what you think. I'm an adult, so I prefer Rocky Horror's approach. Tell me who you are. Don't tell me how to feel. Nice post! I found Rent pretty obnoxious as well, and you elucidate some of the negative factors quite well. Thank you!